Okay – I admit it… I’m a wuss when it comes to hot weather. I have to slather on SPF 40, I hate to sweat, and my face turns an ugly tomato red when I have to be outside for any length of time. Now, if I could be at beach under a pretty striped umbrella with a breeze off the water and my favorite new book in my lap – well, then I could embrace the whole “hot as hell” idea. But on my home turf, I’d just as soon not see the mercury hit 90+. My hometown is Chattanooga, and when I talked to my mom the other day, she said Chattanooga had set an “all-time” record of 105 degrees. It had never before ever been that hot in all the years of record keeping. But enough is enough! The grass is brown. You can burn your hand just opening the metal storm door, and the neighbors’ cats are drinking out of our bird baths and terrorizing the pretty finches. Sheesh! It’s so bad that I have almost given up dreaming about hunky heroes and started fantasizing about crisp October days and warm, wooly sweaters. We’ve got some family plans for Labor Day and then it will be back into the writing trenches for me. I’m working on a fun new proposal which I hope will get a nibble of interest from somewhere! And then I have my next contracted book due November 30. And after that it will be Christmas!! So there you have it, lots of whining from me even though (don’t say it too loud) the temps today aren’t supposed to get out of the eighties!! Putting out a call for questions. If you read Marjorie’s work and have questions, your chance to ask them is coming up. shilohwalker@gmail.com and put QUESTIONS for MARJORIE in the subject line. I will say this, that lady has had some of the best covers I’ve ever seen. Last week, Karen Scott had a post about how romances make our expectations unrealistic. (yes, there are still people out there harping on this…geex, they need to get a life.) You can read the post here, BUT… don’t read it at work. Karen’s blog could probably get you in trouble. I like reading romance. Love it. But would I trade my life for the lives of a woman who lives between the pages of a book? Nope. Not a one. Not Cherijo (yeah, she is sci fi, but she’s like my fave heroine so she’s on the list) Not Eve (yes, ladies, I’d pass on a chance to be married to Roarke) not one of the ladies from the BDB books(JR Ward), even though I love to read them and not one of the ladies from the Irish Jewels trilogy, even though I would love to live in Ireland. Cherijo is married to one heck of a guy but when she’s ticked off or in danger, her husband can use his mind to control her body. That would seriously piss me off. Eve is constantly getting all these gorgeous coats, only to get them ruined by blood, gore and grim. I’d never been able to keep my Ben & Jerrys safe from the BDB books. They get hurt, they turn to ice cream to smear on the wounds. Sorry, that’s a waste of good yumminess. As much as I’d love to live in Ireland, I can’t see me falling in love just to help some cursed fairie prince. So that’s from those books. How many romances heroines have either suffered a big trauma before the book starts or during the books as part of her ‘dark moment’? A lot of the men are written to almost to perfection. I don’t want perfect. Would make me too aware of how unperfect I am. I don’t resolve issues well, or quick. Romances tend to have nice, neat resolutions. Alpha men can be nice to read about but in real life, I’d kill them. I like my DH just fine. He’s a mix of alpha and beta and I wouldn’t take it any other way. Sorry, I don’t see the typical alpha as the ultimate father, husband, etc. Do I like romances? Yep. Do I want to live in one? Oh, hell no. Summer? Was there a summer?? Holy cow, we’re down to the last two weeks and I have no idea where it’s gone! Why can’t winter fly by this fast? I never get nearly as much done as I planned, though that’s pretty much the way of life no matter what time of year it is. But now that it’s down to the wire I’ve got to cram in a few more things before the leaves fall and there’s that first chill in the air. First I’m going to wear all the white stuff in my closet before I sadly put it away and drag out the fall clothes that I look retched in. I cannot wear fall colors. A deep pink or rust is about it. The rest…blah and I look like a baby elephant in jeans. We’re definitely having ribs on Labor Day and doing the home-made ice cream thing once more. And I’m hitting the final sales on summer clothes to get a jump start on next year…if there’s anything left. Seems that when I try this all the leftover stuff looks so shabby and picked over. And I’m running around in bare feet as long as I can get away with it and using my little yellow and white purse a few more times and enjoying the final burst of flowers. So, what do you have planned for the end of summer? What are you determined to get done before we say good-by to the lazy days and jump into fall and football and getting ready for the holidays? 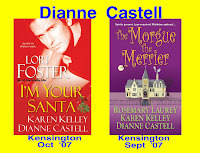 PS—I’ll be giving away I’m Your Santa signed copy (by all three authors Lori Foster, me, Karen Kelley). The two winners who won free ebook downloads of Skin to Skin are…. Ladies, if you all can email me at shilohwalker@gmail.com and put BAM’s contest in the subject line, I’ll hook you all up with Dionne. Again, Jodi and Bernadette won Dionne’s ebook, Skin to Skin and Physmom won a gift certificate. Thanks for joining in guys, and Dionne, thank you for doing the interview. Best of luck with Skin to Skin! Mornin’ one and all – Hope your Monday is off to a decent start. Today’s photo has no particular story behind it, just something to tickle your funny bone. My daughter took it when Anastasia and Ainsley were in the tub being silly. I’m yawning today… hubby and I watched part of the Perseid meteor shower last night. We left the house around 11 and drove thirty minutes out in the country to a camp… very dark there – no streetlights. We saw 22 meteors in an hour and ten minutes. Pretty cool! Our favorite one was super bright and very slow as it arced across the sky. But enough of that! Let’s get to the reason you are reading this blog today. You know how car lots and furniture stores have big sales to “make room for new inventory”??? Well, lucky for you, my keeper shelf simply has to make room for more books. They are taking over my bedroom. So, even though it pains me deeply to part with these, I am having a contest to give one lucky person 48 trade size romances!!! Yep – You heard me… if I did the math right, that is over $672 worth of books. And they can all be yours!! Plus, these are some of my favorites, so there is not a dud in the bunch! Here are the rules. 1) This is a snail mail contest. All entries will be mailed to Janice Maynard, P.O. Box 4611, Johnson City, TN, 37602. Your entry must include your name and address (info kept totally private by me). It must be postmarked by August 31st. I will announce the winner in my September 10 blog… and of course, I will notify the winner personally if you choose to include your e-mail in your entry. How to enter… your completed entry will consist of a simple list of 11 books. First of all, list my 9 Janice Maynard titles, 8 of which can be found on my website. Do not include any foreign editions. The Christmas book only counts once, even though it came out in trade last Christmas and is being re-released in mass market in October. The ninth book is the new one coming out in January 2008 (not yet on my website). But if you go to www.myspace.com/janicemaynard, you can see that cover and title as the big profile picture. The tenth and eleventh books are written by my alter ego ELizabeth Scott. Elizabeth does not have a website, but you can see those two titles at www.myspace.com/authorelizabethscott.